SkyVision Centers optometrist, Sara E. Schoeck is pleased to offer two treatment options for the Myopic child. Nearsightedness, or myopia, has increased dramatically over the last few decades and remains one of the leading causes of poor vision across the globe. Although vision can be corrected with the use of ordinary glasses or contact lenses, severe nearsightedness can lead to an increased risk of certain eye diseases such as retinal detachment, macular degeneration, premature cataracts and glaucoma. While the underlying cause of this increase in myopia remains unclear and the increasing occurrence is not well understood. 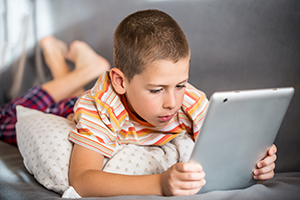 A number of theories have been offered to help explain the recent increase and earlier onset of myopia in children. These theories range from a decrease in outdoor activity, to an increase in time spent doing near work using screens such as laptops and portable or hand held devices like smart phones. Most scientists involved in myopia control believe that the rate of increase in nearsightedness must be slowed to at least one half in order to benefit young patients. Research has provided a number of treatments focused on slowing the increase of myopia in children and currently, two methods seem most practical and effective at slowing nearsighted progression by at least 50 percent. SkyVision Centers optometrist, Sara E. Schoeck is pleased to offer both treatment options to its valued patients. The two methods include the use of Low Dose Atropine eye drops and Multifocal disposable contact lenses. To schedule an evaluation with Dr. Schoeck for your child call 440-892-3931 or click HERE.